I’m all for this lightning-round blogging idea, but as anyone who’s ever tried to have a short conversation with me knows, I’m more of a long-form person. Not sure I can do it, but here goes. June 2012: We went to Iceland, an extended family party of 9. 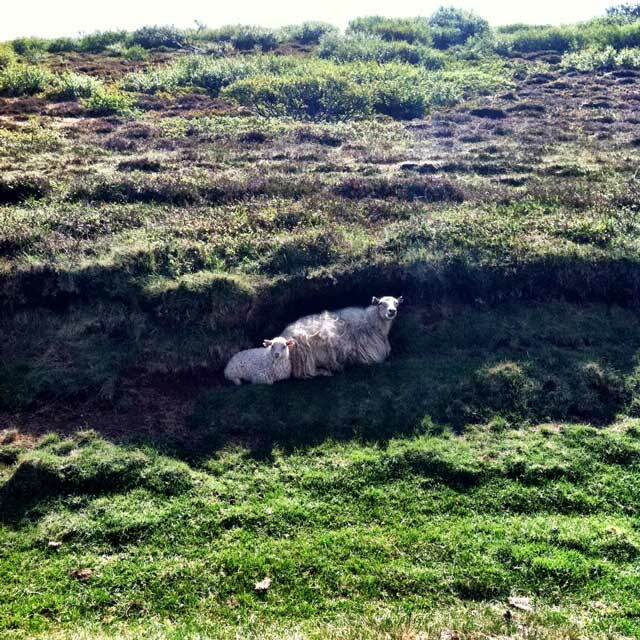 We tasted many local delights, including the local wool, first glimpsed on the hoof. Naturally I wanted to knit with the stuff. 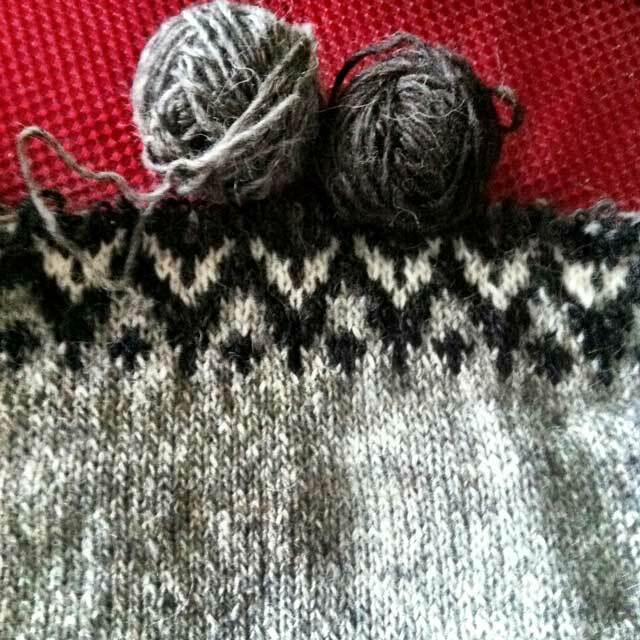 And I wanted to knit the proper Icelandic specimen: the world-famous lopapeysa. We saw many lopapeysas on the streets of Reykjavik. In June. On the young and the old, the tall and the small, the red-haired and the–well, there weren’t that many people without red hair. Lopapeysas are outerwear or, I suppose in the winter, they are middle-layer wear. Wandering around Reykjavik was like being on a Wes Anderson movie set. So many friendly wonders. So much un-selfconscious quirkiness and joyfulness. So much patterned, heavy gauge woollenwear. My chosen lopapeysa: Riddari. I bought enough yarn for 4 of them, one for each teenager in our crew. (Not for nothing, but it’s an economical yarn; you can knit a lopi sweater for less than you can buy one.) The sentiment here: my dear young relations, as you head out into the largeness of the world, there is but one guarantee. If it gets really cold, or you are cast as an extra in a remake of How the Grinch Stole Christmas, you will have an appropriate sweater for that. Knitted with all the love in the world. The next step — I don’t need to tell you — was to leave these sweater parts in a tote bag in the closet for six solid months. I didn’t knit a stitch on them, or even think of them again, until I was packing to go to Omaha for Christmas. Then I remembered the beautiful fantasy of pale girls in Icelandic sweaters knit by their beloved mother/aunt/personal knitter. And I thought, of course it’s possible to finish these 2 sweaters in one week. I’ll be FLYING ON A PLANE. I’ll be SITTING ON THE COUCH. NUMBER 9 NEEDLES. All that’s left is 3 sleeves and 2 yokes–not a big deal. This is what happened next. I knit the second sleeve for Riddari the First on the trip from New York to Omaha. It was fun to join the pieces. I love this style of sweater construction. Bottom-up, in the round. It makes so much sense. All the numbers add up. Bystanders are impressed as hell. I took off on the yoke, like a bat out of hell. With a sure sense that nothing could possibly go wrong. It was going really fast. So much fun. Ann: I know you are a knitter, and that you understand Knitting Fun, yet still I must emphasize very strongly how fun this knitting was. I also want to thank you for teaching me, in our second book (even in a lightning blog we have time to link to our books), how to knit Fair Isle with the yarn in two hands. Then something did possibly go wrong. When the dark grey skein ran out, I accidentally continued with a skein of the similar, but more brownish-grey color from Maggie’s sweater, and knit about 10 long yoke rounds before I noticed it. And a bonus fitting session. Thanks to your two-handed technique, the floats never tangled, so it was a dream to rip out, if that is possible. I shed maybe one tiny rip-out tear but it was otherwise ok. The mistake set me back almost a full day, but at least I knew for sure the thing was going to fit. By Boxing Day I was caught up. Soon it was time for a flight back to New York. Knit knit knit. Unpack unpack unpack. Repack repack repack. Off to Long Island for New Year. On December 30, at 2:30 a.m., after fiddling slightly with Riddari’s final decreases to yield a wider, girlier neck, I bound off, and tweeted a joyful tweet. 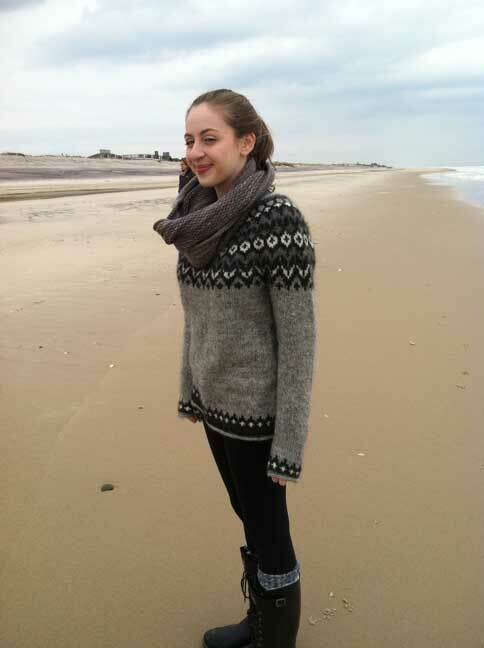 On New Year’s Day, one girl wore a freshly blocked, perfectly fitting stunner of a lopapeysa on the beach. One did not. In the all-out effort to finish two sweaters, I had finished only one. But hey: I finished a sweater! My first lopapeysa! In the midst of it all, I blocked and distributed a modest stack of cowlage. These are all Honey Cowls, and all holiday gifts. I’m still not done with the Honey Cowl. Or it’s not done with me. Happy New Year all! My advice: start the year out with some exhilarating knitting that is out of the ordinary for you. It did me a world of good, that lopapeysa. I start 2013 with a clean slate and a renewed love of KNITTING KNITTING KNITTING. Knitting is just the greatest thing ever. P.S. It’s possible that I’m having trouble with the lightning-round blogging concept. I’m in. Where can I buy a lopapeysa kit or pattern? It is gorgeous…lucky girl(s). Very impressive work! If you put it up on Ravelry, will you explain how you did the neckline without losing the color pattern? As to the lightning round…very commendable effort. Please tell me you bought the yarn in the grocery store. To find this pattern and links to download many more, go over to Ravelry’s pattern page. I linked in the blog post to Riddari, the pattern I used, which you can download instantly. There are many others. 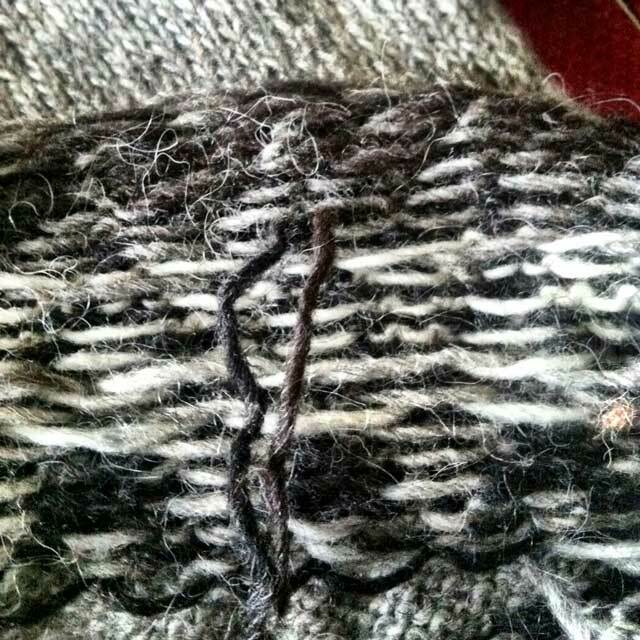 There are also a handful of Icelandic/lopi knitting groups on Ravelry. There are 255 Riddari projects on Ravelry, each more beautiful than the other. I randomly picked it out of a book in a shop in Reykjavik, having no idea that it was a “thing.” When I tweeted pictures of it, people knew it by name! Will put it on my Rav project page, but the neck changes were very simple: I did only half the decreases on the last round of decreases. I alternated them. It was bone simple and didn’t disrupt the pattern. Although if you look closely, you see that the little “capsule” shapes at the top are 3 stitches wide, then 2 stitches wide, then 3 stitches wide. The roll neck obscures it further. I did NOT do the 2 x 2 ribbing at the neck; it’s just a plain roll edge. Also deemed more modern and more feminine, by me. There is no ribbing at the sleeves either. A mistake on the first sleeve, I liked it, so did it to the second sleeve as well. Last tech note: I did not “catch” or twist my floats, which were as long as 7 or 9 stitches in a few places. This wool is STICKY. Especially after a few wearings, they are stuck flat to the back of the sweater and are not in danger of getting pulled out. And it’s much easier to rip this way…. Lightening or no lightening, I am always pleased as punch when there is a new post up on Mason-Dixon knitting. I think you have worn me down though – or brought me over to the dark side, which ever you prefer. I think I am going to have to cast on my first (shocking I know) Honey Cowl. Watch out world! LOVE the sweater. wow – this convinces me that I REALLY need to get out the lopi sweater grandma made me for college to share with my recently minted 12 y.o. sweater appreciator (who wouldn’t touch handknits with a 10 ft pole until this fall). I enjoyed so much of this post, and the sweater is just gorgeous. But I have to tell you, the words “Knitted with all the love in the world” actually brought tears to my eyes when I read them. Damn. It happened again when I typed them. I just typed out a whole objection to a post about Iceland with no mention of volcanoes, but it got swallowed up. You got any volcano stories? I have an 8 year old boy, so I feel obligated to ask. Oh. . . who needs lightning when you’ve got a THUNDEROUS sweater like that to blog about! Nicely done! Iceland is a country that is very interested in volcanoes. Volcanoes are like people there. They talk about them as if they are scary giants who did exciting things and are likely to do them again. We did stand at the edge of a large and beautifully red crater with an icy blue lake at the bottom, and we viewed a famous one from afar, as well as the one that is regarded as likely to erupt pretty soon. We cannot pronounce or remember any of their names. Quinn: you are an old softie! Remember, these are teenagers. It is easier to knit them sweaters, I find, than almost any other form of expressing affection. The last commenter said your phrase brought tears to her eyes. I just have to say I had the same experience. I’m knitting a variation on your mitered crosses for an any-day-now granddaughter. She’s a sick baby and the minute she’s born she has to have open-heart surgery. I cannot imagine anything scarier. My daughter is a testament to motherhood at it’s finest. She refused to get all worried or worked up about this because she was afraid the baby would sense the negativity and would choose not to go on. In fact, when her heart problem was found, the doctors suggested abortion and said she probably wouldn’t grow. She has GROWN! She’s alive and kicking (literally) and the doctors are amazed and are now very hopeful. Still it’s very scary and I’m knitting her blanket with all the love in the world for my newest grandgirl. And that made me cry again. “It’s possible that I’m having trouble with the lightning-round blogging concept.” Funny! I felt, only a few paragraphs in, that it might be a longer-than-15-minutes-to-create post! Love the lightning blogging concept, which meant two great posts in as many days. Also love the concept of new knitting in the new year. 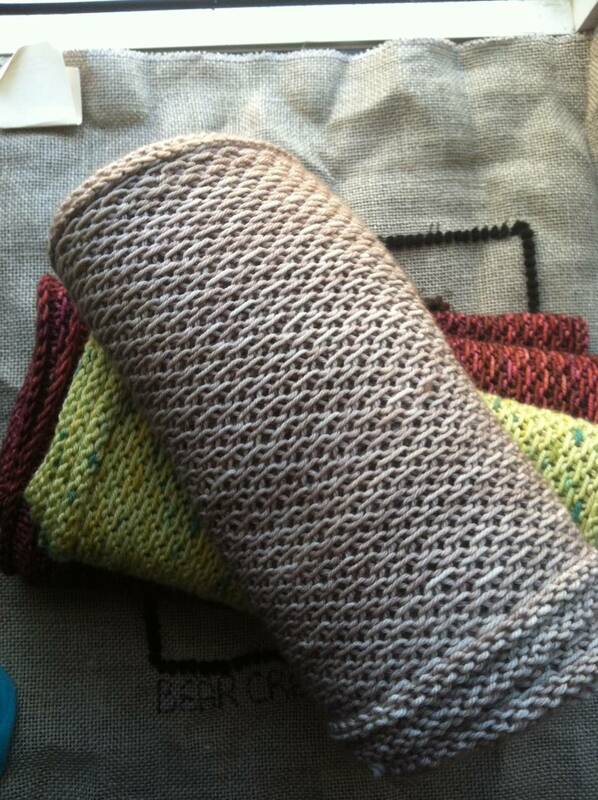 I just realized that I did that too, swatching a mitered cross square…with Lopi laceweight doubled. (Einband in crimson and lime–and sticky in the very best way.) The linked miter is also a great concept! Thanks! Oh man, How did this get in here 3 times. I cannot delete them so I hope you will!! Love the lightning round concept! You’re both great at it. And we’ll never know if you exceeded the time allotment. Love the new word “cowlage”! 🙂 And the sweater and model are both beautiful! I am stunned, speechless, impressed. All that knitting–so little time. You are amazing…and inspiring. I’m off to finish that hot water bottle cover I’ve always wanted to do. Oh and yes…the last center block on my Cornerstone Blanket. Happy New Year! gah, what a stunning sweater! i’d love to try to make one of these with the neck modifications you did. the necks are always the part of sweaters that foil me. I too love the lightening rounds — more Mason-Dixon! Yeah! The sweater is lovely, as are the cowls. Stunning sweater, and great advice. Big needles are calling! Stunning sweater, and great advice! Hm, what don’t I knit? Big needles. Big needles are the answer! Isn’t it great when something so traditional becomes so cool? Love how the design on this comes down the shoulders, like a wrap. Super gorgeous! Iceland!! Lopapeysa!! Thank you for the gift of your blogging time and the gorgeous photos, not the least of which is of your daughter. I’ve only made 2 lopi sweaters but am hooked. Is it possible to have too many? And the wool! So rustic, so REAL. Not baby soft and delicate, but incredibly warm and beautiful. Your family is lucky to have you and the sweaters as a reminder of your love. While I’m drooling over your gorgeous sweater, my heart did a little flippy flop when you mentioned that you’d traveled to Iceland. Our family has decided we need a special trip when our oldest graduates from med school this May and the number one location on his list is Iceland. (We can’t finalize anything until the mid-march match day and he know what his schedule will be.) Anyway, if you have any do’s or don’ts or fabulous Icelandic travel tips, they would be MOST welcome — even in lightening form LOL! IMPRESSIVE!!! How brave you are! The sweater and the model are just dee-lish! Am cozy and warm just looking at the photos of that gorgeous sweater. ‘lopapeysa’, would that rhyme with ‘pop-your-chaser’ or ‘nope-your-chaser’? i literally gasped when i saw the first photo on the beach. Gorgeous! 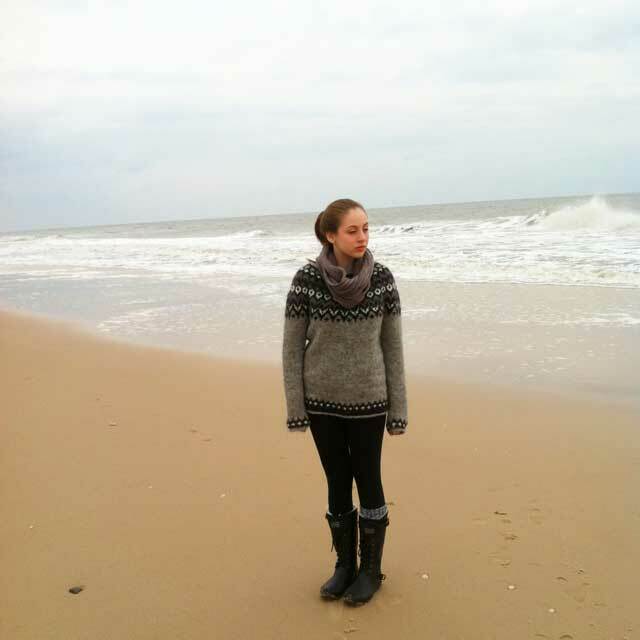 Lovely sweater. Seeing it worn with a cowl makes me hope you had enough yarn left over to knit a cowl to match the sweater, giving the lucky young lady an easy way to fool people into thinking she has TWO lopapeysas! However you wish to blog, just blog more!!!!! Pretty! And I don’t just mean the model! 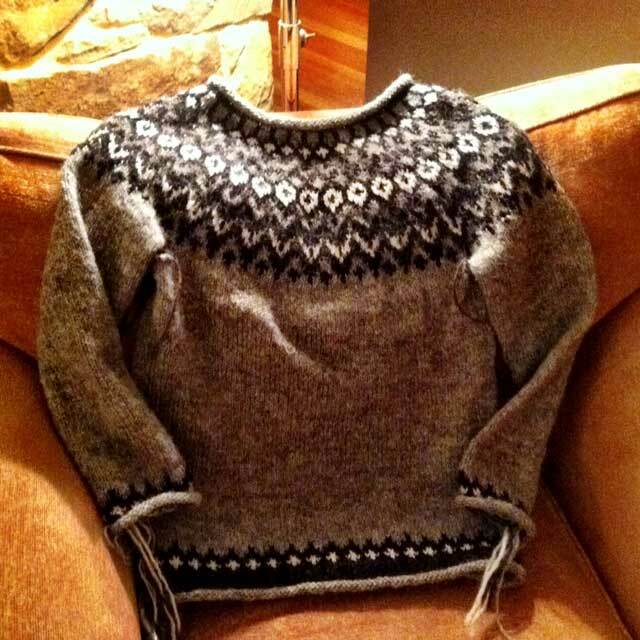 I splurged and bought myself an Icelandic yoke sweater when I was a Freshman in college. One additional miraculous feature of this style is that the sweater still fits fine a whole grown-up lifetime later. Not that I get to wear it much in California. But I love it still. And, ps, how lucky you were not to be on the flight last weekend where the very drunk passenger had to be duct-taped to his seat. I saw it on nyt website, and have heard from some Icelandic friends that they know folks on the flight and it was real!! August was our second trip to Iceland, this time with my parents. My mother, the non-knitter, bought herself a lopapeysa at the Álafoss factory store. I brought back enough wool for two or three more, including a Riddari of my own, and David got another sweater’s worth for himself. Speaking of the volcanoes, I got a lovely photo of the reconstruction of the Viking era turf-roofed cathedral church at Skálholt, with Hekla volcano in the background. My new year’s project has been getting a print of that made for my father-in-law, who was born to Norwegian immigrants in Hecla, SD. On our next trip – because there will most certainly be a next trip – I hope to visit Akureyri and Mývatn in the north. Because Iceland just isn’t a lightning-round kind of place. It makes my heart LEAP that you are both planning to perhaps blog a wee bit more often in the coming days/weeks/months, for your blog is just so wonderfully witty, fun, inventive, informative, and charming. Thank you Mason-Dixon gals! Can you see my big smile? Gorgeous! You and Iceland rock. I love everything about this post–you had me at the sheep shot (duh) but then, sweaters knit with love and a teenage girl modeling it happily for new years, looking fabulous & fashionable in it and more honey cowls. siggggh. A good omen for 2013! Great lopapeysa. Mine, of yarn bought at the source, has been named. “The Icelandic Saga Lopapeysa.” That may be a clue: it is not done. Lightning or long form, it’s all good! I love this, it’s so beautiful. I have been to Iceland too, it’s a wonderful place, and the people are just amazing. The whole place is so palpably under populated, it makes the ‘national character’ really unique – they have a very quirky sense of humour and are incredibly open and at ease with themselves. I also love their folktales and sayings and used one as inspiration to write my dissertation – a story based on the notion that if one sits and knits on the doorstep/porch in winter it will slow the arrival of spring…I long to go on a return trip. We had the most amazing, impulsive long weekend, and managed to see the northern lights and spend a day in the blue lagoon, it was magical. Lightning comment, 15 seconds: Wow! My daughter was a heart baby, but I didn’t know before she was born. She’ll turn 15 this month! It is soooo scary when the tiny ones need surgery (but what scared me the most was that I had never ever thought about babies being ill enough for hospital and surgery). I’ll be thinking of the women of your family as you pull through this together – be strong for one another. Very enjoyable reading. Honey cowling is still happening in this household, too. 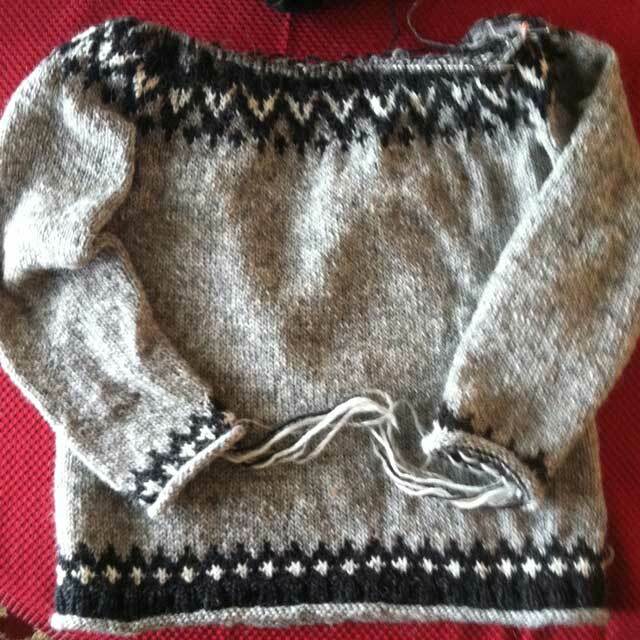 The first full sweater I ever knit was an Icelandic sweater out of the old Reynolds Lopi when I was in college. Love your mods, love the post and just about to renew passports for our own HS Grad/50th Birthday/25th Anniversary a year later jaunt to Iceland this summer. And to Sally, who accidentally posted 3x, your post brought tears to my eyes. My thoughts are with you and your family. As EZ said, Keep knitting on through all crises. Isn’t Iceland the greatest? Along with your lopapeysa gal on the beach on Long Island, of course. Lovely, lovely! I think it’s okay to go over the time limit, especially if you do an Iceland edition! We, too, are thinking of going there this coming summer. I just have to finish up all those UFOs lying around the house before embarking on a lop-whatever. Or 4. I loved this post for so many reasons. My first knitting project ever was a Lopi sweater. And, I’m going to Iceland in March. Any advice? The best place to score some Lopi yarn? The number of empty suitcases I should bring for said yarn? Must visit attractions? Maybe I’ll Dig my old Lopi out of the closet to wear while I’m there! Brenda @January 9 03:49pm, I’d say bring a couple of extra suitcases – but if you’re buying yarn at the Alafoss factory outlet they’ll ship. And they sell not only yarn but wonderful blankets, too. @debby(m) Thank you so much for such a good report on your heart baby. Today was my daughter & SIL’s visit to all the specialists and they estimate baby Emme has grown to 7 lbs. How amazing that is! With their first daughter it was at-home, midwife, nothing at all medical. This is going to be the polar opposite. The highest of high tech and lots of medical people and places. And we are so grateful for that and for those people. Thanks again for the positive words. I’m telling me daughter now. OK, the sweater is gorgeous and the fact that the model doesn’t look like she needed heavy bribing is even better. Well done! Awesome sweater! I’m going to Iceland this coming June for a wedding and can’t wait. I just finished my first Lopapeysa and have started another, a vest this time. Nice to know people wear them in June! !